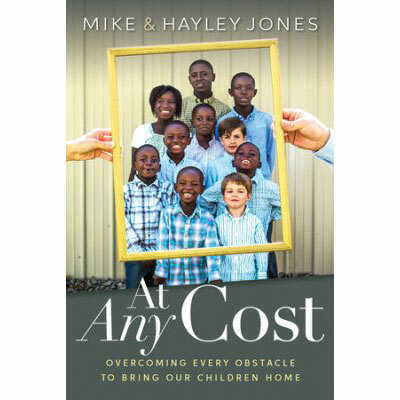 When Mike and Hayley set out to adopt a child from Sierra Leone, Africa, never in their wildest imaginations did they dream this venture would lead to the “Jones Dozen.” This dramatically moving story will amaze and inspire any reader. Their stunning observation: “It was the least we could do!” Mike and Hayley Jones set out to adopt one, or maybe two, African children. They had no idea where this chaotic, inter-continental road would take them. How could a search for a child explode into a tribe of eight young kids—who didn’t speak English? The nation of Sierra Leone had no formal adoption process, causing Mike and Hayley to spend many months in Africa that involved more than ten lengthy trips. At Any Cost traces a heart-wrenching 34-month journey in response to God’s call to Africa. You will be inspired. Mike and Hayley Jones already had two biological sons (ages 1 and 5) when they decided the time was right to pursue adoption. After a 3-year process, the family now calls themselves the "Jones Dozen." all eight adopted children (ranging in age from 6 to 16) are biological siblings, comprised of seven boys and one girl, who came from a family where the father had died and the mother was unable to support the family. The Joneses make their home in Thompson Station, Tennessee, a suburb of Nashville.